If you are in a business where you are constantly cutting concrete, you will realise that there are many hazards that you may face. These hazards are not limited to injuries that could be sustained from the blade of the saw. 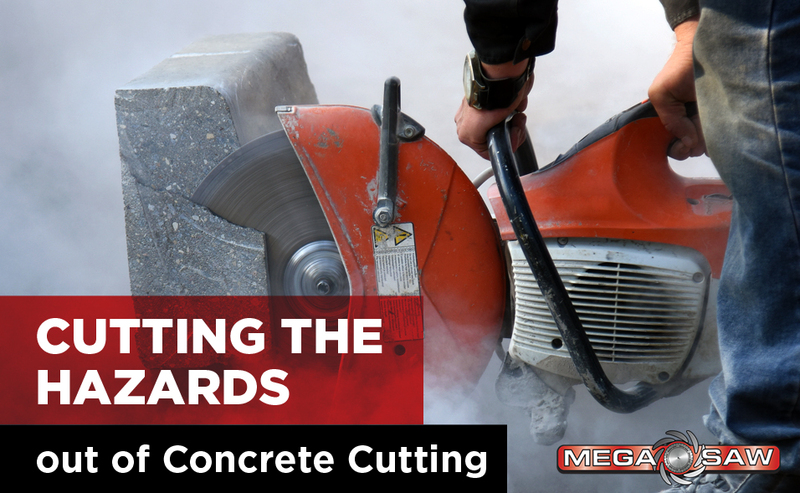 Hazards such as saw kickback, silica dust, collapsing walls, and toxic exhaust fumes are just a few of the many problematic situations that someone cutting concrete will face. There are ways to avoid many of these problems, especially if the equipment is used properly. Additionally, safety equipment must also be utilised in order to ensure the safety of those that are cutting through concrete using a concrete cutting saw. What Are Some Of The Most Hazardous Situations When Cutting Concrete? Some of the most hazardous situations involve what are called pushback or kickback. As you are cutting through, you may suddenly feel that the saw is not moving as it should. Sometimes the force can be so strong that it can displace the saw, causing it to move out of its fittings, leading the saw to run freely across the ground. It’s not uncommon for obstructions beneath the concrete that can’t be seen above the concrete. This will also cause some type of a kickback, or even pull the saw in, based upon the resistance provided by the unknown substance. Pinched cuts, off-line cuts, and blunt cutting edges can also lead to injuries that can be severe if the operator is not careful. Some of these situations can easily be avoided if proper precautions and preparations are made. For example, hazardous dust is going to be on each and every job site that you do. This could simply be dust from the concrete or the dust that is produced by cutting through a material such as asbestos. However this dust is produced, it can cause initial and future problems for the operator. To avoid this, the operator must wear the proper safety equipment which will include a mask or respirator which prevents dust from getting into their lungs. Another problem that can be avoided occurs most commonly when cutting through concrete pipes. There is often increased pressure on the saw, causing it to pinch as it is almost through the pipe, leading to kickback injuries or even the blade shattering. To avoid this problem, ample pressure must be applied to the pipe to keep it even, preventing any type of pinching from occurring. This involves proper preparation, and the knowledge that pinching can occur when operating a concrete saw when cutting through different diameters of pipe. By using proper safety equipment, and preparing for every job thoroughly, you can avoid many of the problems that have been mentioned. The key is to be prepared for each type of job and to be aware of the potential problems that can occur in each situation. As long as you have proper safety equipment, a breathing apparatus, and awareness of potential problems, many of these injuries can be avoided very easily.